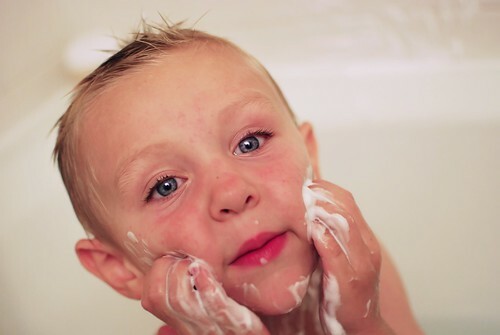 we have some shaving cream bath soap that Caden LOVES to play with! Great photos - does your bathroom have lots of light? I don't see a hint of noise! Too cute. Looks like fun, I bet my boys would like that. How cute and fun. I love Harpers goofy smile. But I agree with Jaimee, your light must be great in the bathroom. Not just the grain, but no tinge of yellow at all! Mia's been wanting to shave her legs...she's THREE!!! I am totally getting out the shaving cream next time Nadia's in the bath - what FUN! Love those silly faces. And I agree with J & J - you must be blessed with a well-lit bathroom! Looks like a blast! OUr kids got some kid shaving cream/soap and I swear they used it all up within 2 or 3 baths. They love that stuff! That looks like a lot of fun! I never thought to do that but will be doing so very soon. I love these pics! The kids are so cute and have so much fun in the bathroom with shaving cream!